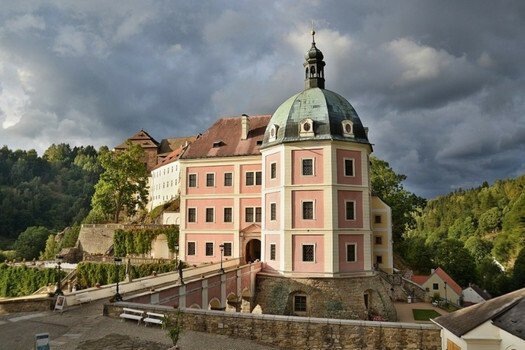 In the west part of the Czech Republic near the world famous spa town Karlovy Vary, on the right bank of the river Teplá and in the middle of the romantic landscape of Slavkovský les…it can be found a picturesque little town and this place can be the only one - Bečov nad Teplou. However this location is full of cultural and natural monuments, the main attraction is without doubt a set of historical architecture compound of a gothic castle, a renaissance palace and a baroque chateau. 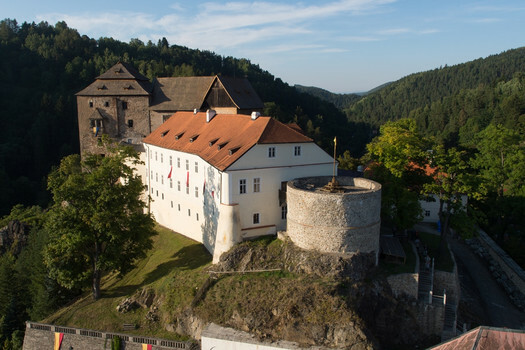 The castle complex at Bečov was founded in the early 14th century by the lords of Osek who owned it along with the surrounding demesne for almost two hundred years. The castle experienced its most significant development under the Pluhs of Rabštejn in the late 15th century and in the first half of the 16th century. The original Gothic castle occupies the highest position on the hilltop, it was improved with stone portals and mural paintings during a Renaissance remodelling. The courtyard of the castle is surrounded by a quadrangular chapel tower, as well as the Pluh Palace and stables. Below the castle there is an 18th-century palace whose central section dates back to the Renaissance period. Proposed 19th century adjustments to plans by Romantic architects Josef Zítek and Josef Mocker were only implemented to a minimal extent.